But Broad’s enduring support for public charter schools now appears to be contributing to problems for an old friend, presidential candidate Hillary Clinton, whom he has long supported financially. Clinton appears poised to receive the endorsement of the nation’s largest teachers union, the National Education Association (NEA), this weekend, but the potential endorsement is causing controversy among many rank-and-file members. Similar outrage emerged when Clinton received the endorsement of the second-largest national teachers union, the American Federation of Teachers (AFT), in July. The NEA’s rank-and-file outrage is dominating many national headlines, just as the AFT outrage did, stealing the focus from what should be a public relations victory for Clinton. Part of the concern is due to her past support of charter schools and connections to Broad, as well as her connections to Bill Gates and the Walton family, who are also major financial backers of charter schools that directly threaten union teacher jobs. An alternate candidate in the field, Sen. Bernie Sanders, a declared socialist with a track record of full-throated support of unions, makes a better candidate, according to some NEA and AFT members. “[Clinton’s] labor credentials are significantly worse than her main challenger in the Democratic primary, Vermont Senator Bernie Sanders,” wrote Huffington Post blogger and former NEA member Ben Spielberg, who also pointed out that Clinton once served on the board of directors of Wal-Mart. Several NEA state branches have already called on the organization to withhold any endorsement. 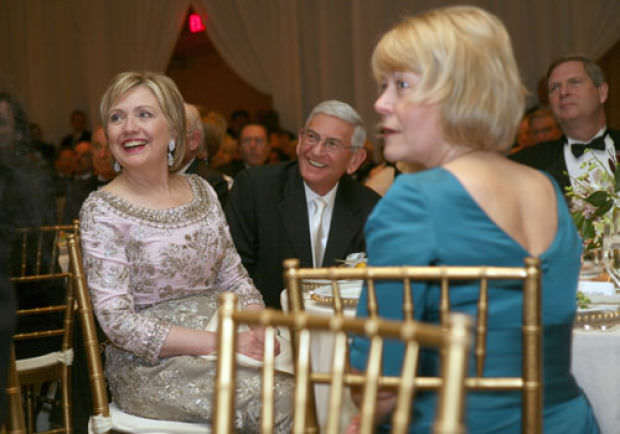 The Broads and Bill and Hillary Clinton have connections that go as far back as 1983 and as recently as Sept. 19, when Bill Clinton attended the second opening night of the Broad Museum in downtown Los Angeles. The Los Angeles Times quoted Clinton at the gala talking about their friendship, which dated back to when Hillary was Broad’s lawyer. “I looked up one day and Eli was in my living room, and my life has never been the same,” Clinton said. Broad, through one of his corporations, gave $100,000 to Bill Clinton’s presidential reelection campaign and was one of the controversial “Lincoln bedroom donors” who gave the then-president some bad headlines due to the perception that Clinton was using the White House to raise campaign funds. Broad endorsed Hillary Clinton for president in 2008, has donated over $100,000 to the Clinton Foundation and was recently a co-chair of the Super PAC “Ready for Hillary” that was formed to draft Clinton into the 2016 race. It has since dissolved. * Updated to reflect Ben Spielberg is a former NEA member, not a current one.